Medical malpractice law is the elephant in the room for those considering investing in China’s healthcare sector. In March, the Chinese government issued a large scale plan for reforming medical institutions. Part of those reforms include attracting private and foreign capital to invest in hospitals, clinics, and other medical institutions (as the Communist Party Central Committee highlighted in the Third Plenum Decision), but a few other phrases highlight doing a better job of resolving medical disputes. better systems to resolve disputes involving the medical system. In recent years, disputes between doctors, hospitals and patients in China have been in the news, in policy reports, and scholarly articles, with descriptions of beatings, brawls, and killings occurring in Chinese hospitals. The current problems have been highlighted (in English, at least) on this blog, in the press, in NGO reports, and analyzed in several law review articles, including a detailed study by Professor Benjamin Liebman, of Columbia Law School. What issues is the Court looking at? the concept is to strike a balance between protecting the interests of the patients and enabling normal operation of medical institutions. in a medical dispute, if a party is found to have been tampering with the medical record, as a result of which it is not possible to determine causation or the extent of damages, the party who has tampered should bear the adverse legal consequences, and the party who cannot explain internal inconsistencies and errors in the medical record should also bear the advertise legal consequences. A press report in January, 2015 mentioned that the Court has started work on drafting a judicial interpretation on medical malpractice issues. If previous legislation is any guide, it is likely that the drafters will be looking to foreign jurisdictions with developed medical malpractice legislation when considering these issues. The Court will consult with the relevant regulatory institutions, such as the China Food and Drug Administration and the National Health and Family Planning Commission. Will the Court solicit public opinion? 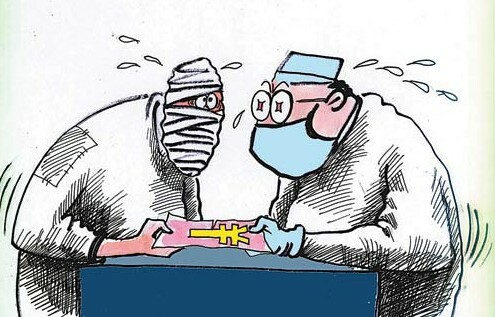 Investors considering investing in Chinese medical institutions (or doctors practicing in China), should anticipate a more robust medical malpractice system, although not immediately. This entry was posted in Medical malpractice and tagged medical malpractice, medical malpractice cases, medical malpractice law, medical violence.